Sept. 22, 2014, 11:53 a.m.
By Joseph Lichterman @ylichterman Sept. 22, 2014, 11:53 a.m. In December, St. Louis Public Radio reporters Chris McDaniel and Véronique LaCapra published an investigation into whether Missouri was violating state law by buying drugs to execute prisoners from a company not licensed in Missouri. In the months since, they’ve continued reporting on the issues surrounding Missouri’s execution practices, and McDaniel recently published another story on the state’s use of controversial lethal injections. The finished product was nearly 2,000 words, replete with embedded documents and a large infographic created by another staffer. McDaniel also produced a short radio report and appeared on one of the station’s talk shows to discuss the story. McDaniel’s work shows off a kind of reporting and production muscle that might not have been possible for St. Louis Public Radio when these investigations started just a few months ago. Last December the NPR-affiliate merged with the St. Louis Beacon, a local nonprofit outlet founded by former St. Louis Post-Dispatch editors. 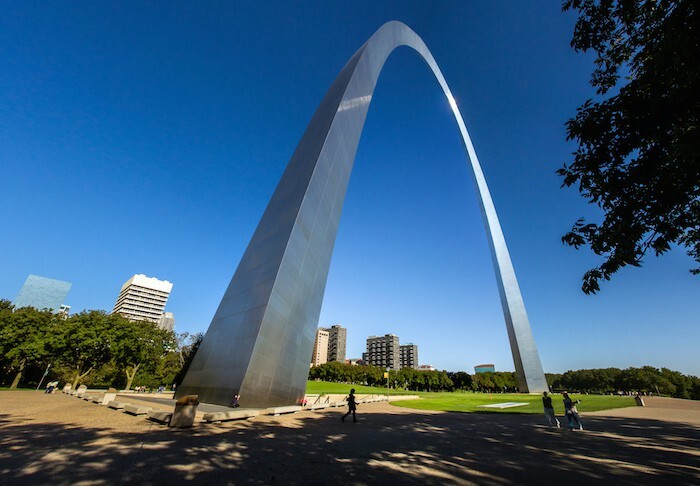 Combining the two organizations’ newsrooms, plus adding a number of new hires, has more than doubled the size of their joint newsroom, which kept the St. Louis Public Radio name. “To maintain the kind of commitment it takes to stay with that story would’ve been really difficult previously,” said St. Louis Public Radio editor Margaret Wolf Freivogel, the founding editor of the Beacon. In May the station even joined in a lawsuit with the Reporters Committee for Freedom of the Press and the Missouri chapter of the ACLU seeking information on executions that they alleged the state was withholding. “It’s a big investment, and not just monetarily — because I’m very divorced from the money side of this lawsuit — but it’s an investment in time and it’s us saying that we think this is important and we think that we are one of the outlets that are providing oversight,” McDaniel said. Beyond the lethal injection series, St. Louis Public Radio has aggressively covered a number of stories that have combined its various mediums. “Accounted For,” a series on chronic absenteeism from education reporter Tim Lloyd, included animated video on a standalone web-page that was built by visual journalist — and former Beacon staffer — Brent Jones, along with a 50-minute on-air discussion of the topic on a St. Louis Public Radio talk show. But the biggest test of the new newsroom’s capabilities were the protests that erupted in the St. Louis suburb of Ferguson after Michael Brown, an unarmed teenager, was shot and killed by police there last month. Reporters on the ground braved tear gas and rubber bullets to report on the protests. Engagement editor Kelsey Proud worked 16-hour days at the height of the unrest to continuously update the site’s live online coverage, and Jones built several digital features, including an interactive audio map, to provide more context and background on Ferguson. In August, during the height of the Ferguson protests, St. Louis Public Radio’s web traffic was five times higher than normal, said Tim Eby, the station’s general manager. “It’s been unbelievable this month,” he said in an August interview. But even before the Ferguson story broke, St. Louis Public Radio had seen a 23 percent increase in unique visits since the merger, with about 115,000 uniques per month. Page views pre-Ferguson were also up about 50 percent, with about 322,000 per month. In October 2012 the two news organizations signed an agreement to look into the feasibility of forming alliance. The two outlets, both nonprofits, had already collaborated on a number of projects, but they were interested in finding ways to combine their resources to better serve the St. Louis community. With a $40,000 grant from Knight Foundation, the two outlets hired a consulting firm to explore how best to achieve their goals. It quickly became clear that a full-blown merger, of both the newsroom and the business operations, made the most sense for the organizations. Both focused on similar content — politics, arts, education, science, and technology all with a public-service perspective. Joining forces would let them combine their reportorial resources to offer more and deeper coverage of these topics across multiple platforms. Though both the Beacon and St. Louis Public Radio shared some donors and financial benefactors, both felt that with a larger combined organization they would be able to maximize sponsorship dollars. They projected that the merger would result in a $3 million revenue gap in the first five years, but the organization has received pledges to cover the gap and will continue to fundraise to ensure its financial stability, Eby said. The Beacon’s three-person business staff was integrated into St. Louis Public Radio’s staff as part of the merger. Last November, after more than a year of planning, the merger was made official after the University of Missouri’s governing board unanimously approved the move. The board’s approval was necessary because the University of Missouri owns the station’s license. The Beacon staff moved into St. Louis Public Radio’s office, which opened in 2012. The space, which is located in a University of Missouri-St. Louis building, benefits from being in St. Louis’ Grand Center neighborhood, an area that is home to many of St. Louis’ arts and cultural gems. The combined organization with more than 60 total employees and an annual budget of about $7 million began operating as one last December. Initially the joint outlet was called St. Louis Public Radio and The Beacon before it ultimately decided to just maintain the St. Louis Public Radio name. “We moved back to St Louis Public Radio as a brand, which is okay, but the danger in doing that was falling back into just being a radio operation. So we had to be very intentional that even though we were branding ourselves as St Louis Public Radio, we were still very much a digital organization as much as a radio station,” Eby said. Though he noted that the station might revisit how to rebrand itself sometime next year. The merger between the Beacon and St. Louis Public Radio has been relatively smooth, according to interviews with those at the station and with outside observers. But the merger has not been without some challenges. Maybe the biggest challenge was figuring out how to combine the staffs of the radio station, where the main focus was on producing stories for the radio, and he Beacon, which was an online-only product. In the months after the merger, there were training sessions to help former Beacon staffers learn how to report for the radio and how to think differently about audio stories. And while the prior iteration of St. Louis Public Radio had a web presence, staffers had to adjust to being able to present stories online without necessarily having a corresponding radio component. To that end, St. Louis Public Radio has worked on focusing its coverage on five verticals and developing a new editorial structure for its enlarged newsroom. They’ve also created a separate team that produces its radio newscasts and better integrated its newsroom with its locally produced talk shows. Prior to the merger, most of the St. Louis Public Radio staffers were general assignment reporters. With the addition of the Beacon staff they’ve been able to formalize additional beats while also narrowing some job descriptions. Before the merger, for instance, Proud, the engagement editor, was St. Louis Public Radio’s de-facto web editor. In addition to her work with social media, she also would edit every story posted on the radio station’s website. “When that element was taken away, and our new editing structure was put in, I had a lot more time to think creatively about how we might do more and better engagement work,” she said. The larger combined newsroom staff, coupled with the stronger editorial focus, has allowed the new St. Louis Public Radio to cover more topics in more depth, according to Integrating Newsrooms in St. Louis, a new paper produced by researchers at the University of Missouri. 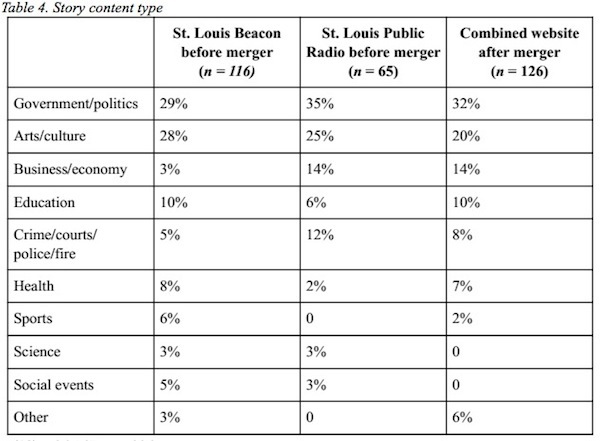 The researchers analyzed stories the Beacon and St. Louis Public Radio each published online over a two-week period before the merger, followed by a two-week period analyzing the combined site after the merger. Prior to the merger both outlets heavily covered government and politics, and that emphasis continued: thirty-two percent of stories on the combined site were about government or politics, according to the paper. Researchers also found that the in joining the organizations, each brought its own strengths to the union. “The Beacon brought a secondary emphasis on education news to the combined site, and St. Louis Public Radio brought a secondary strength in business/economic news,” the study said. The study suggests the new St. Louis Public Radio may also be able to separate itself from competitors with new forms of coverage. After the merger, 56 percent of stories published were interpretive or analytical stories, compared to 34 percent before the merger for St. Louis Public Radio and 49 percent for the Beacon. Prior to merger, 48 percent of St. Louis Public Radio’s stories were spot news, that figure dropped to 18 percent after the Beacon staff was added in. 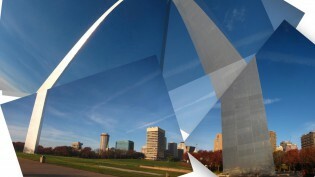 Photo of the Gateway Arch by Jason Mrachina used under a Creative Commons License. POSTED Sept. 22, 2014, 11:53 a.m.
Lichterman, Joseph. "Better together: How two St. Louis nonprofit newsrooms are learning to thrive as one outlet." Nieman Journalism Lab. Nieman Foundation for Journalism at Harvard, 22 Sep. 2014. Web. 20 Apr. 2019. Lichterman, Joseph. "Better together: How two St. Louis nonprofit newsrooms are learning to thrive as one outlet." Nieman Journalism Lab. Last modified September 22, 2014. Accessed April 20, 2019. https://www.niemanlab.org/2014/09/better-together-how-two-st-louis-nonprofit-newsrooms-are-learning-to-thrive-as-one-outlet/.